This is a very nice specimen of Calymene niagarensis. This classic Silurian trilobite is from the Rochester Shale of New York. The ancient arthropod is wonderfully prone and well displayed. The complete bug is very 3-dimensional and exhibits fine detail - both free cheeks are present. 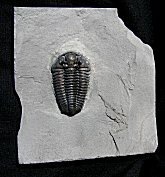 The beautiful trilobite has great color and contrast and is well showcased on the large matrix plate. This is a very nice, distinct specimen of Calymene niagarensis.